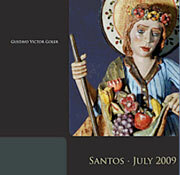 Project: Wrote essay on contemporary santero for gallery catalogue and website. Detail: Melissa Totten. GUSTAVO VICTOR GOLER: SANTOS. Santa Fe, Blue Rain Gallery, 2009.